If you are trying to find the most effective heart-healthy eating plan, the Mediterranean diet might be perfect for you. The Mediterranean lifestyle incorporates the basics of healthy eating — plus a splash of flavorful olive oil and perhaps a glass of red wine — among other components that best reflect traditional cooking styles in countries that live along the shores of the Mediterranean Sea. 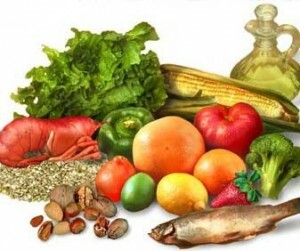 The characteristics of the Mediterranean diet include eating much higher amounts of fresh fruits and vegetables, than other western pattern diets. You'll be using healthy vegetable oils, like olive oil when you cook and as a condiment. Fish is a hallmark of the Mediterranean way of eating: fish or shellfish is at least twice a week on a menu, and may be there daily, while red meat may only happen once a week or even less. Whole grains and small portions of nuts are also one of the essentials. Research has shown that the traditional Mediterranean diet reduces the risk of heart disease. In fact, a recent analysis of more than 1.5 million healthy adults demonstrated that following a Mediterranean diet was associated with a reduced risk of overall and cardiovascular mortality, a reduced incidence of cancer and cancer mortality, and a reduced incidence of Parkinson's and Alzheimer's diseases. 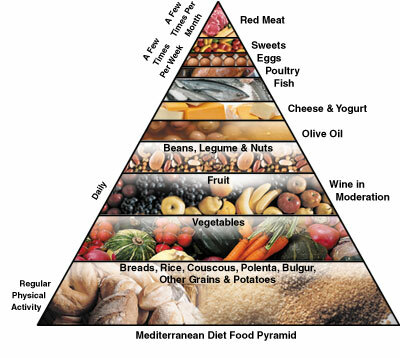 The Mediterranean diet traditionally is fundamentally based on fruits, vegetables, pasta and rice. For example, residents of Greece eat very little red meat and average nine servings a day of antioxidant-rich fruits and vegetables. The major benefit? A lower level of oxidized low-density lipoprotein (LDL) cholesterol — the "bad" cholesterol that's more likely to build up deposits in your arteries. Grains in the Mediterranean region are typically whole grain and usually contain very few unhealthy trans fats, and bread is an important part of the diet there. However, throughout the Mediterranean region, bread is eaten plain or dipped in olive oil — not eaten with butter or margarines, which contain saturated or trans fats. Add a splash of balsamic vinegar and some fresh herbs and sea salt for a delicious dip for whole grain breads. The focus of the Mediterranean diet isn't on limiting total fat consumption, but rather to be wise about the types of fat you eat. The Mediterranean diet discourages saturated fats and hydrogenated oils (trans fats, fried foods), all of which contribute to heart disease. The Mediterranean diet uses olive oil as the primary source of fat. Olive oil provides monounsaturated fat — a type of fat that can help reduce LDL cholesterol levels when used in place of saturated or trans fats. "Extra-virgin" and "virgin" olive oils — the least processed forms — also contain the highest levels of the protective plant compounds that provide antioxidant effects. Monounsaturated fats and polyunsaturated fats, such as canola oil and some nuts, contain the beneficial alpha linolenic acid (a type of omega-3 fatty acid). Omega-3 fatty acids lower triglycerides, decrease blood clotting, are associated with decreased sudden heart attack, improve the health of your blood vessels, and help moderate blood pressure. Fatty fish — such as mackerel, lake trout, herring, sardines, albacore tuna and salmon — are rich sources of the most beneficial omega-3 fatty acids, EPA and DHA. Fish is eaten on a regular basis in the Mediterranean diet. I always suggest supplementing with 1000 mg combined EPA and DHA in addition to eating a fish based diet. The health effects of alcohol are a subject of heated debate. Many doctors and nutritionists are reluctant to encourage alcohol consumption because of the dire negative health consequences of excessive drinking. However, alcohol — in moderation — has been associated with a reduced risk of heart disease in some research studies. Also some studies feel that a small amount of alcohol contributes to healthy brain aging. The Mediterranean diet typically includes a moderate amount of wine. This means no more than 5 ounces (148 milliliters) of wine daily for women (or men over age 65), and no more than 10 ounces (296 milliliters) of wine daily for men under age 65. More than this may increase the risk of health problems, including increased risk of certain types of cancer. If you're unable to limit your alcohol intake to the amounts defined above, if you have a personal or family history of alcohol abuse, or if you have liver disease, refrain from drinking wine or any other alcohol. Also keep in mind that red wine contains compounds that may trigger migraines in some people. Eat an abundant array of vegetables and fruits — and switch to whole grains. A variety of plant foods should dominate your plate. Try to have three fourths of the "real estate" on your plate occupied by fruits and veggies. They should be fresh, and ideally in season. Strive for seven to 10 servings a day of veggies and fruits. Switch to whole-grain bread and cereal, and begin to eat more whole-gain rice and pasta products. Cut the white flour products out of your meals. Keep baby carrots, apples and bananas on hand for quick, satisfying snacks. Fruit salads are a wonderful way to eat a variety of healthy fruit. Olive Oil not butter. Try olive oil as a healthy replacement for butter and get rid of margarine. Use olive oil in cooking. After cooking pasta, add a touch of olive oil, some garlic and green onions, and a small handful of parmesan for flavoring. Dip bread in flavored olive oil or lightly spread it on whole-grain bread for a tasty alternative to butter. Try tahini (blended sesame seeds) as a dip or spread for bread too. Spices replace salt. Herbs and spices make food tasty and are also rich in antioxidants and healthy aging compounds. Season your dishes with herbs and spices rather than salt. Limit red meat. Substitute fish and poultry for red meat. When eaten, make sure it's lean and keep portions to about 4 ounces. Also be very sparing with sausage, bacon and other cured high-fat meats. Pork is the most inflammatory of all protein sources. Choose less and only low-fat dairy. Limit higher fat dairy products such as whole or 2 percent milk, cheese and ice cream. Switch to skim milk, fat-free yogurt and low-fat cheese. Eat Goat cheese. Vino, Grape or Pomegranate Juice. If alcohol isn't an issue for you have a glass of wine at dinner. If you don't drink alcohol, Purple grape juice has the same antioxidant benefits as wine. Pomegranate juice is a delicious lower sugar alternative.